A University of California Irvine research project may be the first of its kind to attempt to measure the impact and feasibility of the use of robots to bring homebound students into the classroom when they can't be there physically. 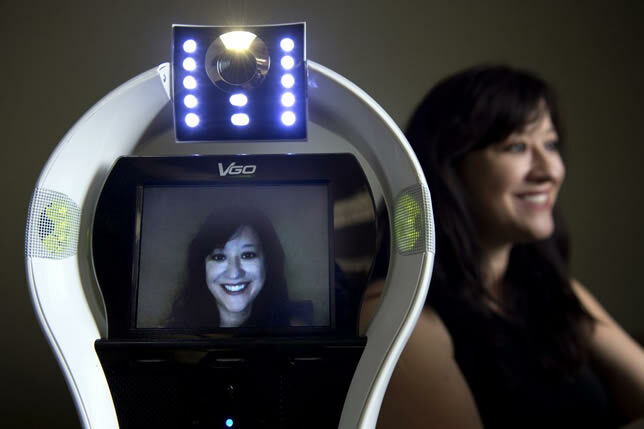 The use of "virtual inclusion" through telepresence has been used for nearly two decades. More recently, the idea is that chronically ill students use some kind of robotic device on campus that can be operated from home to allow him or her to participate in class, interact with fellow students and navigate through school. Frequently, these devices are provided by wealthier parents or through community support, reported researchers Veronica Newhart, a Ph.D. student in UC Irvine's School of Education, and Mark Warschauer, a professor of education and informatics. But they wanted to find out what the impact could be on kids who received the robots no matter what their family's income level, background or social support. The areas they explored included how the robot is used in classrooms by students, teachers and classmates; what the effects of robot use are; and whether the use of the robots is "financially and functionally feasible." As explained in "Virtual Inclusion via Telepresence Robots in the Classroom: An Exploratory Case Study," the results were pulled from observation, focus groups and interviews among 61 participants -- five homebound children, five parents, 35 classmates, 10 teachers and six school administrators. The kids at the heart of the study had used or were already using a telepresence robot. What they found was one "common thread": the students who use the robotic surrogates said they felt more "socially connected." "When asked what they liked most about using the robot, all of the homebound children interviewed responded with a variation of 'I get to see my friends,'" the report stated. "When asked what they liked least about using the robot, the responses varied greatly from 'nothing really' to connectivity issues, to wishing the robot had arms." As for the adults, they tended to focus on the academic areas. For example, one mother was "initially concerned" that due to his medical condition, her son wouldn't be able to attend a full day of class. "His energy level and interest in school had dropped off dramatically and she believed he would be able to attend school for maybe thirty minutes to one hour a day," the authors wrote. Instead, what happened was that once the student received his robot, "his interest and energy increased and he attended a full day of school (six hours)." It was only then that his mother realized that his lack of interest in school activities might have been the result of depression. This particular student expanded from four hours of instruction per week to six to seven hours per day, five days a week. In fact, he not only did well in his regular classes, but he auditioned for and was accepted into the school choir via the robot. "Further research is required to determine the impact of robot utilization on students' health and well-being, as well as the most effective ways to implement this technology in various settings," said Newhart in a university article about the study. "Collaboration among education, technology and healthcare teams is key to the success of virtual inclusion in the classroom for improved learning, social and health outcomes for vulnerable children." Newman presented the findings at the 23rd International Conference on Learning, held in July at the University of British Columbia. She plans to continue her research in additional school districts elsewhere in the country. This fall, the university itself will become home for telepresence robots — a gift from the class of 2016. As Newhart explained, the robots will act as "a solution for any student who's prevented from completing a course or degree program because of a long-term injury or illness."